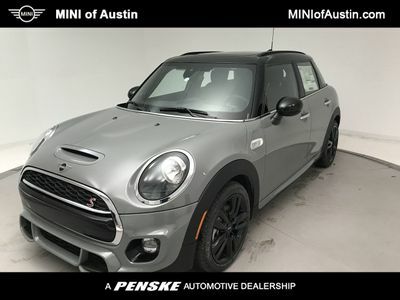 Emerald 2019 MINI Cooper S FWD 6-Speed 2.0L 16V TwinPower Turbo Active Driving Assistant, Auto-Dimming Interior & Exterior Mirrors, Automatic Climate Control, Comfort Access Keyless Entry, harman/kardon? Logic 7? Digital Surround, Heated Front Seats, JCW Leather Steering Wheel, LED Fog Lights, LED Headlights w/Cornering Lights, Panoramic Moonroof, Piano Black Exterior, Piano Black Interior Surface, Power-Folding Mirrors, Premium Package, Signature Line Package, SiriusXM Satellite Radio, Wheels: 17" x 7.0" Tentacle Spoke Silver Alloy. Advertised price for all untitled 2019 previously reported as Type Z Demos is inclusive of all applicable cash rebates, including but not limited to AMP Cash. Other manufacturer programs may be available in lieu of AMP Cash, please see dealer for complete details and current offers.